From custom shower glass & bath glass to storefront glass & unique staircase glass, we are here to help you transform your home or business with custom glass solutions created specifically for you. Glass features can add a unique one-of-a-kind look, feel, and functionality to your property. Custom windows, glass shower glass and bath enclosures, storefront glass, mirrors, and staircase glass are often the first thing noticed by visitors. Home and business owners throughout Massachusetts and the greater Boston area trust us to install everything from glass shower doors to curved glass staircases. Make a strong impression with all who enter your home with our full spectrum of glass solutions. At Fast Glass Service Inc., our transparent process and unwavering dedication to customer satisfaction ensures quality results every time. 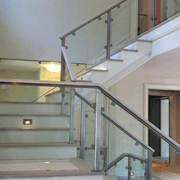 We provide custom glass solutions to meet the scale and budget of any size project. Whether you want to install a single custom shower in your home or you're an interior designer, architect or general contractor looking to install new glass elements in a large apartment or condo complex, our Massachusetts glass company professionals are here to help you with all of your glass service needs. Get started today! 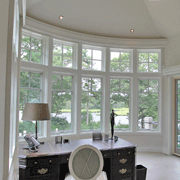 Give us a call at (781) 629-2200, email us at fastglass@fastglass.info or send us a message on our contact page. An investment in your bathroom is an investment in yourself. You use this space every day to invigorate with showers and relax with baths. Our custom glass shower doors, glass shower enclosures, neo angle shower glass, tub and bath glass, and mirror solutions can take your personal retreat to the next level. Imagine waking up to the glass shower or bath enclosure of your dreams – you may have to pinch yourself! At Fast Glass Service Inc., our Massachusetts shower glass company professionals will make your glass shower door to order – giving you the opportunity to customize it to your exact specifications. Breathe new life into your existing or new home by incorporating our tranquil glass elements into your bathroom and daily life. Beyond what our shower doors can do for your personal bathroom, our glass work has the ability to make a quality impression on acquaintances, clients, and customers. Glass storefronts enable businesses to promote visibility, showcase inventory, and even provide space for flyers to promote community events. Specialty and custom glass, mirror, and staircase glass elements can be fabricated and installed to match the geometric style of your art deco studio, the clean minimalism of your modern medical office waiting room, the elegance of your traditional restaurant, and any other style and project in the greater Boston area. Discover why our clients continue to choose Fast Glass Service Inc. for their glass service needs and recommend us to friends.